Cold Pressed - One of nature's richest sources of essential fatty acids. 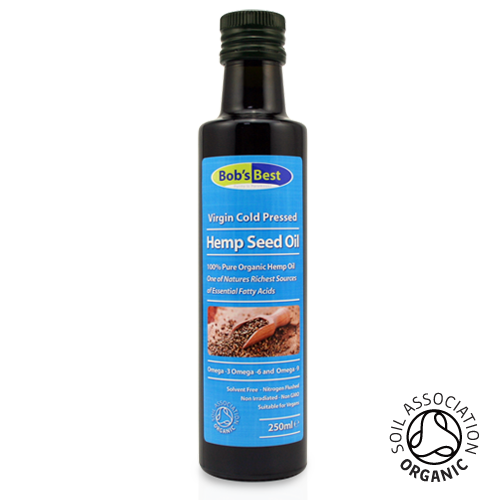 Hemp seed is one of the best known sources of the two essential fatty acids (EFA's) that we can't live without. Omega 3 Alpha-Linolenic acid and Omega 6 Linoleic acid. EFA's are as vital to human life as vitamins and minerals. Like minerals, our body cannot produce them on its own. Hemp oil is natures most balanced oil for human nutrition (3:1 LA to LNA ratio) and is easily digestible. Directions for use: Simply add to food to improve both the flavour and nutritional content of your meal. Do not heat as this will greatly reduce its beneficial effects and destroy many of the EFA's. Add to food once removed from direct heat to improve flavour and nutritional content. 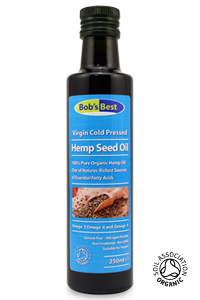 Storage instructions: Keep your Hemp Oil refrigerated and tightly sealed. Air, heat and light will damage it so always make sure it is tightly capped when not in use. Rancid hemp oil is harmful and should not be consumed. Cold pressing increases the shelf life and if stored correctly can stay fresh for up to 12 months. It can also be frozen to further extend its life.